For decades, NASA has released enormous scientific balloons into Earth’s atmosphere, miles above the altitude of commercial flights. The Balloon Program is currently preparing new missions bearing sensitive instruments, including one designed to investigate the birth of our universe and another with ballooning origins that will fly on the International Space Station. 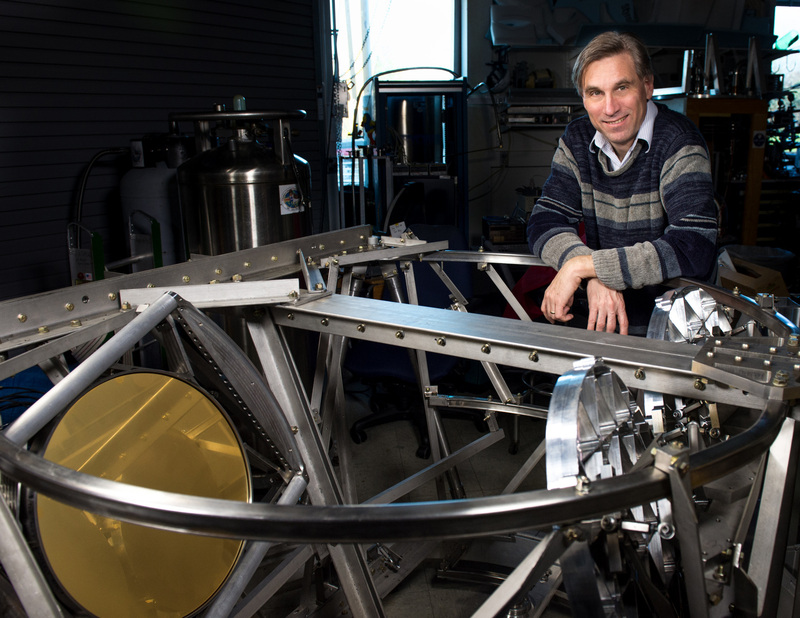 Al Kogut, an astrophysicist at NASA Goddard, poses with one of the millimeter-wave telescopes for the Primordial Inflation Polarization Explorer (PIPER) balloon mission. NASA’s Primordial Inflation Polarization Explorer (PIPER), which will launch a series of test flights over the next few years, could confirm the theory that our nascent universe expanded by a trillion trillion (1024) times immediately following the big bang. This rapid inflation would have shaken the fabric of space-time, generating ripples called gravitational waves. These waves, in turn, should have produced detectable distortions in the cosmic microwave background (CMB), the earliest light in the universe lengthened into microwaves today by cosmic expansion. The patterns will appear in measurements of how the CMB light is organized, a property called polarization. Discovering twisting, pinwheel-like polarization patterns in the CMB will prove inflation occurred and take astrophysicists back to the brink of the big bang. While Albert Einstein’s theories accurately describe gravity in today’s dilated cosmos, these large-scale physical laws did not apply when our universe was still the size of a hydrogen atom. To reconcile this disparity, PIPER will map the entire sky at four different frequencies, differentiating between twisting patterns in the CMB (indicating primordial gravitational waves) and different polarization signals due to interstellar dust. To maintain sensitivity, the telescope will fly immersed in a bucket of liquid helium the size of a hot tub but much cooler — nearly 457 degrees below zero Fahrenheit (minus 272 degrees Celsius) and close to absolute zero, the coldest temperature possible. The PIPER mission was designed, built and tested at NASA’s Goddard Space Flight Center in Greenbelt, Maryland, in collaboration with Johns Hopkins University in Baltimore, the University of British Columbia, Canada, the National Institute of Standards and Technology at Boulder, Colorado, and Cardiff University in Wales. From its new vantage point on the International Space Station's Japanese Experiment Module - Exposed Facility, the Cosmic Ray Energetics and Mass (ISS-CREAM) mission, shown in the inset illustration, will study cosmic rays to determine their sources and acceleration mechanisms. While PIPER prepares to observe roughly 20 miles above Earth, the latest iteration of the Cosmic Ray Energetics and Mass (CREAM) experiment is scheduled to launch to the International Space Station in August. Although CREAM was balloon-borne during its seven prior missions, the new payload will take the technology past Earth’s atmosphere and into space. 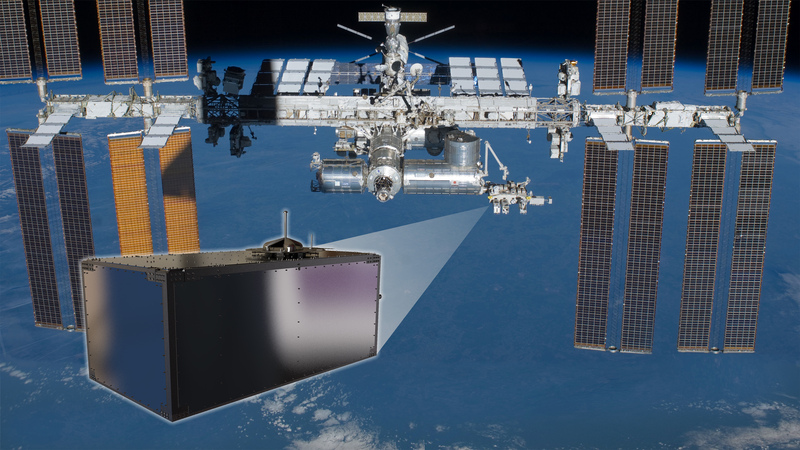 Called ISS-CREAM, the experiment will directly sample fast-moving matter from outside the solar system, called cosmic rays, from its new vantage point on the Japanese Experiment Module Exposed Facility. Cosmic rays are high-energy particles traveling at near the speed of light that constantly shower Earth. But precisely how they originate and accelerate through space requires more study, as does their abrupt decline at energies higher than 1,000 trillion electron volts. These particles have been boosted to more than 100 times the energy achievable by the world's most powerful particle accelerator, the Large Hadron Collider at CERN. ISS-CREAM — about the size of a refrigerator — will carry refurbished versions of the silicon charge detectors and ionization calorimeter from the previous balloon missions over Antarctica. ISS-CREAM will contain two new instruments: the top/bottom counting detectors, contributed by Kyungpook National University in Daegu, South Korea, and a boronated scintillator detector to distinguish electrons from protons, constructed by a team from Goddard, Pennsylvania State University in University Park and Northern Kentucky University in Highland Heights. The international collaboration, led by physicist Eun-Suk Seo at the University of Maryland, College Park, includes teams from numerous institutions in the United States as well as collaborating institutions in the Republic of Korea, Mexico and France. Overall management and integration of the experiment was led by NASA’s Wallops Flight Facility on Virginia’s Eastern Shore under the direction of Linda Thompson, the CREAM project manager. According to co-investigator Jason Link, a University of Maryland, Baltimore County research scientist working at Goddard, the evolution of the CREAM project demonstrates the power of NASA’s Balloon Program as a developmental test bed for space instrumentation. As is true with any complex mission, things don’t always go as planned. Such was the case for the Balloon Experimental Twin Telescope for Infrared Interferometer (BETTII) experiment, intended to investigate cold objects emitting light in the far-infrared region of the electromagnetic spectrum. BETTII launched on June 8 from NASA’s Columbia Scientific Balloon Facility in Palestine, Texas. Although nearly all the mission components functioned as they should, the payload detached from its parachute and fell 130,000 feet in 12 minutes as the flight ended the following day. BETTII Principal Investigator Stephen Rinehart at Goddard estimates it will take several years to secure funding and rebuild the mission. Designed, assembled and tested at Goddard in collaboration with the University of Maryland, Johns Hopkins University, Cardiff University, University College London and the Far-Infrared Interferometric Telescope Experiment team in Japan, BETTII is designed to examine lower infrared frequencies with unprecedented resolution. While optical telescopes like Hubble cannot see stars shrouded by thick dust clouds, far-infrared observations pierce the veil, revealing how these objects form and evolve. After all, just as risk and failure go hand in hand, so do risk and reward.